Your Dentist Is an Expert in Oral Surgery in Manahawkin! When someone mentions oral surgery, you might want to steer far away from the conversation. It doesn’t sound inviting. But the truth is, when you receive oral surgery, you’re probably improving your oral health. 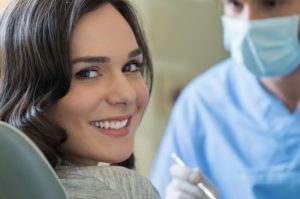 The two main types of oral surgery in Manahawkin that you may face when it comes to your oral health: wisdom teeth extractions and dental implant placement. Learn more about both of them here! What is Oral Surgery and Why Might You Need It? If your dentist recommends you to undergo oral surgery, it’s only because they see a critical issue concerning your oral health. If you have a bit of anxiety or fear about your oral surgery recommendation, we’re here to help you understand why they might be necessary. Oral surgery is used to resolve injuries or issues in the head, neck, face, jaws, and hard and soft tissues. As mentioned above, you might undergo surgery to extract wisdom teeth or replace teeth with dental implants. Your wisdom teeth may only partially develop, leaving a flap of gum tissue that can trap food and dental debris. Your wisdom teeth may come in at an awkward angle and affect your oral health. Your jaw may not be large enough for your wisdom teeth to develop and they will become stuck beneath the gums (impacted). Infections, damage to other teeth, or cysts may form because of impacted teeth. They can cause your teeth to crowd and shift, developing TMJ disorder or other concerns. As you can see, your dentist will only recommend extracting your back teeth to preserve the health of your smile. They eliminate other health issues that come with tooth loss. They look and feel like natural teeth. They will enhance your quality of life. They help patients achieve a fully-functioning, new teeth in a short amount of time. They will improve appearance and self-esteem. They help patients enjoy the foods you love again. Overall, your dentist in Manahawkin has your best interest in mind when completing any dental services that concern your oral health. If you would like to learn more about how your dentist can help you, feel free to call your local office! After receiving his dental degree, Dr. Young went on to complete a two-year post-graduate degree in implant surgery from the Misch Institute of Implantology, one of the highest respected school associated with oral surgery. Not only that, but Dr. Young is also trained in other forms of oral surgery, oral sedation, and IV sedation. If you need oral surgery to relieve dental pain—whether it’s to do with implant placement or extractions—you can trust Dr. Young! Comments Off on Your Dentist Is an Expert in Oral Surgery in Manahawkin!